The international benefits consulting firm gave delegates the chance to relax after several days at its annual Ibis Academy conference with a gala dinner at Gosford House, near Edinburgh. Pre-event planning: International benefits consulting firm Ibis Advisors hosts the annual Ibis Academy, which includes a conference, held in Edinburgh from 7-11 May. The global company needed a flexible venue to host its annual gala dinner at the end of the conference. Delegates included corporate heads of HR and insurance industry regional heads, along with many of the company's sponsors, and some spouses. Key goals included offering delegates a chance to relax after several days of meetings, and also to network. Ibis Advisors manager Conrad Starr says: "The gala dinner is a break from intense conference sessions. It is also a chance to interact with the global peer group and make contacts." Challenges: Starr viewed around 12 venues before choosing Gosford House for the dinner. Gosford House events and marketing manager Rob Steadman says: "They were looking for a venue that would be flexible and could hold 180 guests - as they promoted the venue to their delegates the numbers grew." Starr says: "Rob gave us options and assurances every step of the way, and figured out how to avoid renting a marquee, which we didn't want to do." Some guests had dietary requirements so making sure they received the right dishes at the dinner was important. 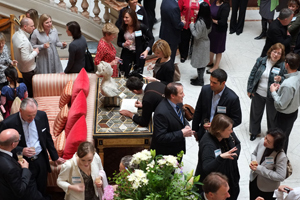 Solution: Delegates arrived early evening for a prosecco reception in the venue's Marble Hall. The bagpipe performance, originally planned for outside, was moved indoors due to rain. Dinner was held in the Billiard Room, Octagon and Dining Rooms. Regarding dietary restrictions, Starr says: "I went with Rob's chef's suggestion and we identified each guest (around 20) with restrictions and placed a sticker on their chair back." After dinner, guests adjourned to the Marble Hall for coffee and whisky, while staff cleared the dining room to make space for a ceilidh band. Post-event analysis: Starr says the event was "very successful", adding: "I can attest to the impressive responsiveness and client attention of the team. The food was great too." The event even came in under budget, based on an expectation of unknown extra expenses, which did not materialise.